Our culture is what shapes our habits, language and what is considered acceptable in society. This variation in culture is what makes our world so interesting and a main motive in why people embark on their travels around the world. If you speak English, you could be forgiven for thinking that most terms of endearment around the world would be based around sweetness ("Honey", "Sugar", "Sweetheart", "Cupcake"). But when you move beyond your basic "dears" and "darlings", it's a lot more complicated than that. There are apparently few rules in the language of love and here we explore 10 brilliant terms of endearment ranging from poetic to those which are ridiculous and damn right rude. In Japan, calling someone "tamago gata no kao", translates to "an egg with eyes" and is a huge compliment, as having an oval-shaped face is seen as very attractive. Thankfully, it does not refer to a fried-egg with two yolks and a bacon smile. In Persian, "moosh bokhoradet" means whoever you are talking to is adorable. But the literal translation is "may a mouse eat you!". It's not that weird. British grandparents can still be heard saying "I could just gobble you up" to their grandchildren. It's much cuter with the mouse don't you think? "Chen yu iuo yan meaning "diving fish, swooping geese" is an elaborate way of calling someone beautiful. It is a reference to two of the most famous ancient beauties of China: one so beautiful that when she looked into a pond the fish forgot to swim and sank to the bottom; the other, made the geese forget to flap their wings. So a pond full of dead fish and a field full of dead geese. They must have been lookers. In France, “mon petit chou” is used the same way the English say sweetheart, but the direct translation would actually be “my little cabbage”. To be fair, the French do also have a cabbage-shaped sweet pastry called “chou à la crème” so, when they call their love ones petit chou, they probably have in mind the sweet pastry rather than the hearty vegetable. Probably. For the most part, Italian phrases expressing affection translate effortlessly into English. "Microbino mio" meaning "my little microbe" is an exception. Maybe it's good bacteria, like in those little yoghurt drinks. Dutch people call their loved one "mijn poepie", which literally translates to "my little poo". Calling someone this in England may not generate the response you are hoping for. Dutch people don't have a particular reputation for romance in England. If you were to call someone "bogarkam" in Hungary, you are likely to receive a smile and some affection in return. Translated to English you find you are calling someone my little insect. In German, "Zaubermaus" translates as "magic mouse" and although this is suitable term for a wife or daughter, call a grandparent "zaubermaus" and you may just find they become offended. It's probably a generational thing. In Poland, calling someone "kruzynko" is a term of endearment. 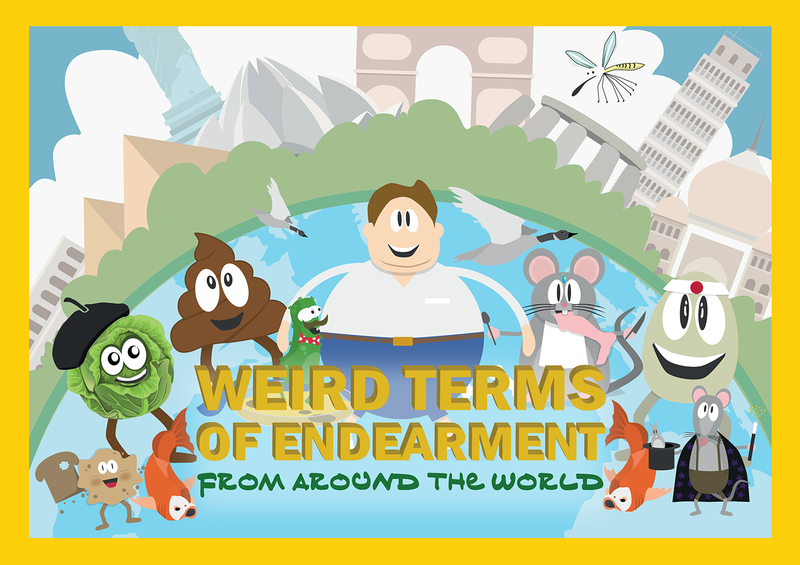 It means "breadcrumb", which doesn't sound like the most flattering thing to call your loved ones, but is a lot better than "insect","germ" or "poo". As outrageous as it may sound to the English, in Ecuador and other Latin-American countries, it is very common to call your loved one "gordo" or "gorda", literal translation = "fatso". Because when you really love someone, you love their flaws too.